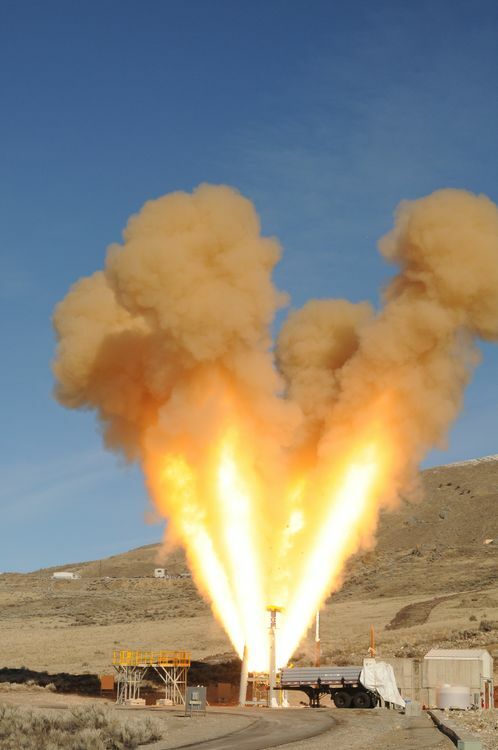 December 17, 2018 – Northrop Grumman Corporation along with NASA and Lockheed Martin successfully performed a ground firing test of the abort motor for NASA’s Orion spacecraft Launch Abort System (LAS) at Northrop Grumman’s facility in Promontory, Utah on December 13. The abort motor is a major part of the LAS, which provides an enhancement in spaceflight safety for astronauts. The completion of this milestone brings Orion one step closer to its first flight atop NASA’s Space Launch System and to enabling humans to explore the moon, Mars and other deep space destinations beyond low-Earth orbit. The mission for Orion’s LAS is to safely jettison the spacecraft and crew out of harm’s way in the event of an emergency on the launch pad or during initial launch ascent. The abort motor test, Qualification Motor-2, was the culmination of a series of component tests conducted over the past few years in preparation for qualification. Data from the test will confirm the motor can activate within milliseconds and will perform as designed under cold temperatures.